Yet one of the best things about T. Yoshisaurus Munchakoopas is that he’s not just another cute animatronic dinosaur: This kid’s got a lot of talents! 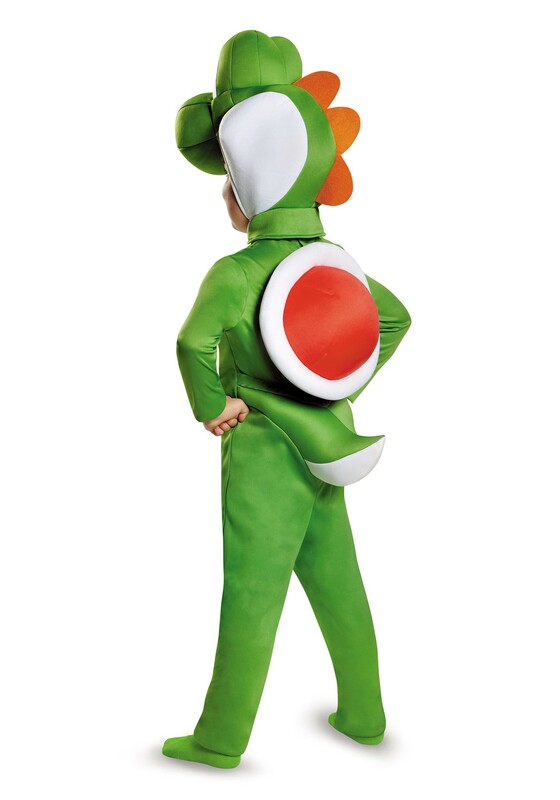 He’s probably best known for possessing a fantastic talent for grasping and throwing things with his tongue, but it doesn’t even stop there…after grabbing the objects, you might be lucky enough to see Yoshi swallow it and produce a spotted egg, which is pretty much his equivalent of a golden egg. Yoshi is like his fellow video brethren in that he’s a noted user of the “Ground Pound”, which is just like it sounds - dropping bottom-first after a jump in order to destroy blocks or damage opponents (it’s pretty killer to behold). But even though he can sting like a bee, don’t think he can’t float like a butterfly: The “Flutter Jump” is one of his signature moves, where he jumps up fast and comes down slow…so great for beating flying or floating obstacles. Finally, those looks ain’t for nothin’: Yoshi’s snoze can detect hidden collectibles as well as flowers by smell, and can even be used as a weapon. 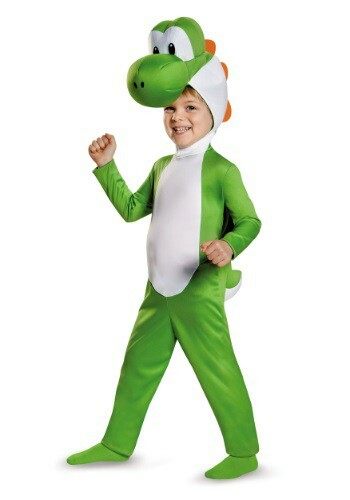 Which is all to say: This Yoshi Toddler Costume is great! It's super comfortable and easy to pull on and slip off (the jumpsuit fastens w/ Velcro at center back). The hood has a soft-sculpted snout & brow on top and fastens with Velcro under the chin, and the stuffed tail is sewn to back. The foam shell can also be stuffed with tissue or fiberfill for shape, and fastens to the back of the suit with Velcro! One look at your little one in this Yoshi Toddler Costume and you'll be doing flutter jumps of their own!